Supports joint and soft tissue health and may reduce inflammation and joint pain. An advanced formula that supports joint and soft tissue. Maintaining your joints and soft tissue is essential whether you lead an active lifestyle, play sports, or simply wish to age with your working parts in tiptop shape. NuMedica Join Replete contains effective natural ingredients that support even your most complex joints such as your knees. These ingredients may also reduce inflammation due to arthritis and enhance the development of normal bone and cartilage. Others have reported a reduction in joint pain. 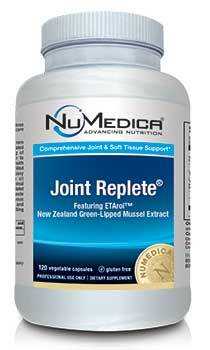 NuMedica Joint Replete contains ETArol made with superior quality whole green-lipped mussel extracts. In fact, recent research suggests that this mussel extract may be more effective than fish oil when it comes to alleviating arthritis pain and increasing joint mobility. NuMedica Joint Replete also contains glucosamine, which is integral to cartilage renewal. In addition, the inclusion of MSM can help set the stage for the body to product more cartilage. Chondroitin, also contained in NuMedica Joint Replete, can actually improve the quality of the cartilage for enhanced soft tissue and joint support. People who take NuMedica Joint Replete may find that their joint mobility is enhanced. Some people may even experience less joint pain and improved functionality in their joints. If you suffer from arthritis, you may also find that your swelling and joint pain is reduced. If your joints are currently functioning as they ought, this supplement will help you maintain their excellent health and functionality. Other Ingredients: HPMC (vegetable capsule), silica, stearic acid. Contains: Shellfish (crab, shrimp, lobster, crayfish) derivatives, sy. Free of: Milk, eggs, fish, tree nuts, peanuts, wheat. ETArol™ is a cold-processed proprietary extract of New Zealand green-lipped mussels (Perna canaliculus). Caution: Persons with a known allergy to shellfish should not use this product.